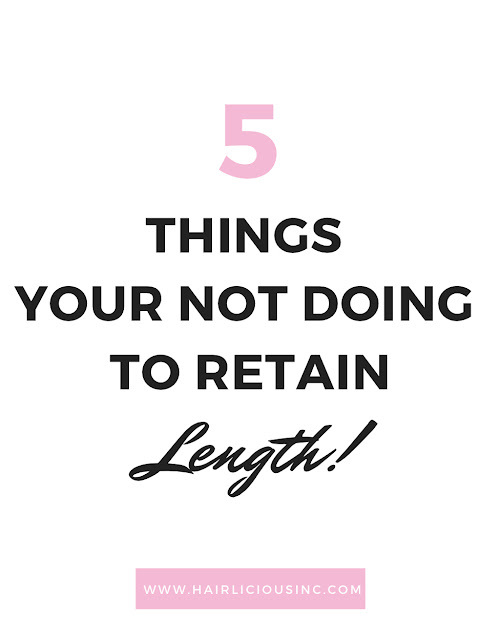 5 Things Your Not Doing To Retain Length! - Hairlicious Inc.
5 Things Your Not Doing To Retain Length! Since I began my hair care journey back in 2007, I've literally received thousands of questions on how I grew my hair to the length that it is now. I know many hope to believe that there's a "magical" product that will keep your hair healthy and grow it all the way to mid-back length overnight - but there isn't! Growing long healthy hair takes commitment, of course, and a combination of doing several hair care practices - consistently! Let me be the first to let you know that products alone will not help you retain length. There are five "necessary" things you need to be doing in your regimen in order to increase your length retention and enjoy healthier longer hair. Honestly Hairlistas, products are important to help you manage your hair, whether you are relaxed or natural; however, it doesn't end there. I would say 90% of a successful hair routine (i.e. retaining length) is comprised of healthy practices and consistency throughout the process - no s e c r e t s! Here are the things that you're not doing when it comes to retaining length and growing your hair longer than ever before. This is huge! Probably one of the most important things you can incorporate into your hair journey is moisturizing and sealing your ends. How often? Well that all depends on your hair i.e. porosity level, density etc. Your ends are the oldest part of your hair. Since my hair is mid-back length, my ends are approximately 3-4 years old and they are the most fragile area of my hair. I've learned that the health of your ends determine whether or not you will retain length or not (trim, breakage, split ends). Oh don't forget, dry hair breaks! Failing to moisturize your ends on a consistent basis can lead to dryness which can result in split ends and breakage. Breakage is the #1 cause for not retaining length; therefore, you need to prevent it from happening in the first place. Moisture, moisture, moisture! A big mistake I made when I first began my hair journey was the constant amount of manipulation in my fragile over-processed relaxed hair! Back then, I felt as though "the more I do to my hair, the more my hair would grow", for example, frequent detangling/brushing/combing, constantly changing hairstyles, trying tons of products at once etc. I thought the more attention I showed my hair i.e. manipulating it, the more it would grow. That was quite the opposite :( Keep things simple and leave your hair alone! Stick to your usual wash day routine and try to leave your hair alone until next washday. Try detangling once a week, instead of styling your hair daily. Throw it up in a bun, rock a wig, or opt to keep it in braids or weave for a couple months. Most importantly, use less direct heat i.e. flat ironing, blow drying, curling etc. Less manipulation i.e combing, styling etc. prevents the loss of protein in the hair, hold ups the integrity of the strands and decreases breakage = healthier ends = more length! LESS is MORE! Contrary to popular belief, washing your hair often is a good thing. By often I mean every 3-4 days or once a week. The reason I say this because water is the ultimate moisturizer and the more your hair touches water, the more moist it will be, helping to preventing breakage. Frequent washing not only cleanses the scalp but it stimulates blood flow which then helps to increase growth to longer hair = length retention! When your hair is healthy, length will come! Deep conditioning is imperative to achieving and maintaining overall healthier hair. All of my hair idols deep conditioned at least once a week for 20-30mins, more importantly, using a heat source i.e. heat cap, hooded dryer, steamer. Deep conditioning treatments assist in making the hair manageable and fortified to resist damage i.e. breakage. Using a heat source helps to open the cuticles along the hair shaft so that the nutrients from the treatment can penetrate to the cortex of the hair shaft. Deep conditioning helps to heal damage from the inside outward for longer stronger hair. This is such an under developed skill in the healthy hair care community! Many tend to silence what their hair is truly telling them, instead they are listening to others and tuning themselves out. I hate to break it to you, but if this skill isn't developed, the success of your hair journey is at risk. Just because a hair friend endorses a product but your hair is screaming for you to stop using "said product", that doesn't mean you continue. If your hair begins to excessively break, shed, become rough or dry to the touch, after repeated use...STOP and listen to your hair. If you notice your hair is dry - moisturize it. If you notice your hair is extremely limp - do a protein treatment. If you notice that your hair breaks horribly every time you blow dry and flat iron - stop using direct heat! Your hair will speak to YOU and guide YOU, you just have to sit back and listen. I hope you enjoyed these tips. They are the real deal and I've sworn by them as they've helped me retain and maintain my length over the years. Great tips! Deep conditioning with heat is amazing! It makes such a huge difference in my hair.